In Celebration of International Women's Month! 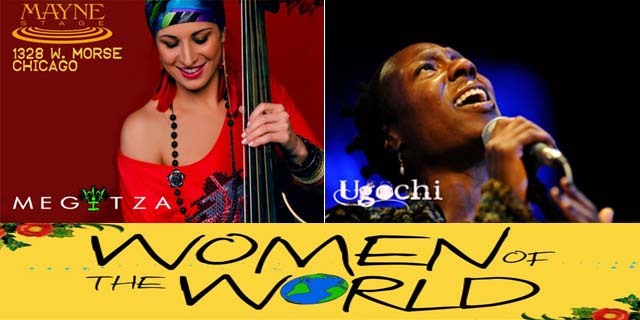 In celebration of International Women’s Month Sound Culture presents two of Chicago’s most renowned international performing artists for the first time on one stage. UGOCHI and The Afro Soul Ensemble (A.S.E.) are taking over the world. Her musical interests span all corners of the globe. Ugochi was born to Nigerian parents in Chicago. She credits both worlds with being the catalyst for her unique word, sound power and singing ability. MEGITZA is a true concert revelation – an unusual voice, charisma and beauty. Her newest album, recorded in studios across the U.S. and Poland, will be released this year. Megitza’s compositions creatively reference Eastern European folk music, combining the traditional with the modern sounds of jazz, pop, rock, and Americana.